GoDaddy gave Web developers worldwide a big F-you on the Fourth of July this year by suspending all their free hosting accounts originally earned as part of the purchasing agreement with GoDaddy when registering a new domain name with them. Apparently, now that GoDaddy is owned by a multi-national corporate conglomerate all they care about is squeezing Web developers for every penny they have. GoDaddy claims that because Microsoft no longer supports the OS running on their Web servers that somehow that negates their agreement to Web developers. If you buy that, we have some land in Brooklyn you might be interested in. Apparently GoDaddy is unfamiliar with the process of upgrading a server’s operating system – a technical challenge of awe inspiring proportions; lol. GoDaddy used to be a good hosting company and domain registrar back in the day when it was still owned by founder Bob Parsons, but now, ever since a multi-national conglomerate took over GoDaddy they have been continually increasing prices while decreasing free services. The final punch in the gut coming Saturday on the Fourth of July when GoDaddy shutdown all free Web hosting and database services without any prior notice. 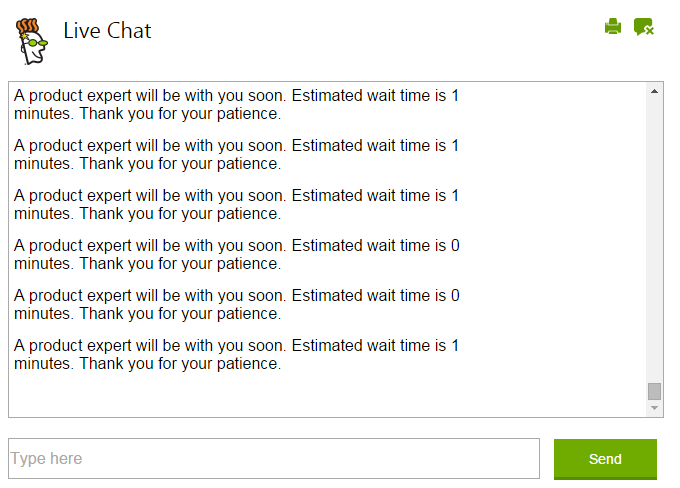 All attempts to reach GoDaddy for an explanation have been futile including waiting over an hour on their customer service chat line while the screen read the estimated wait was 1 to zero minutes. All good things must come to an end and so shall the relationship between Web developers, who made GoDaddy wealthy, and the all mighty multi-national corporation who has only one pursuit in life – greed. Since it is now blatantly obvious that GoDaddy no longer has any respect for Web developers, Web developers should reciprocate in spades. If you are a Web developer who lost your free Web hosting from GoDaddy on their July 4th ambush or a new Web developer just starting out, here is a list of some of the better Web hosting alternatives available: Google Cloud Services, Windows Azure, Amazon Web Hosting, iPage, bluehost, HostGator, and SiteBuilder. Must see TV for computer geeks! 2nd season right around the corner!!! ASP.NET vNext – The Hits Keep on Coming! 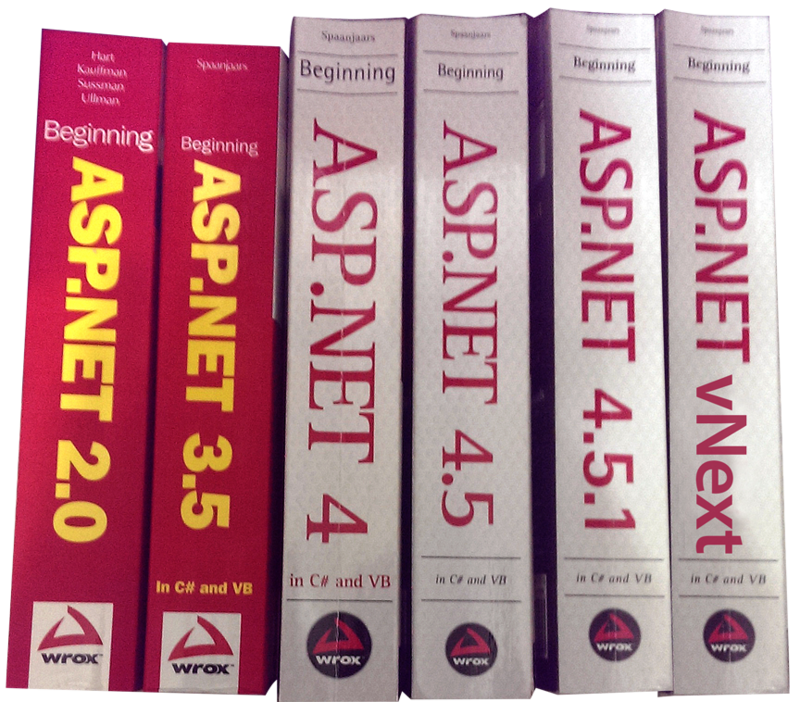 A visual history of the ASP.NET text books (+1 mock one) used in MSJC’s CSIS 116B Web Application Development Course. The next release of ASP.NET often referred to as vNext now seems to have adopted the ASP.NET 5 moniker and is expected to be released at the same time as Visual Studio 2015 (CTP 6 available here). ASP.NET 5 is a complete redesign of the framework. Because of this, there have been some rumors, even outright mis-statements floating around the Web alluding to the fact that there will no longer be support for the Web forms paradigm (see Exit Web Forms? at W3 Schools ASP.NET 5). However, Microsoft’s ASP.NET Overview page reassures Web forms developers of continued support in this and future releases of their now open-sourced framework a commitment re-enforced in this Scott Hanslmen’s blog post in addition to this Telerik white paper. Follow our blog by clicking Follow at the bottom of the page. The target audience in this Mashable Ask A Dev video is Web Developers. The author claims HTTP2 will speed up the transfer of Web pages and its assets over the Internet faster than HTTP 1.1. The authors supports his claim citing multiplexing, server push, and a change in format as the reason for the improvement. Indirectly the author raises the question how can Web developers best exploit the new features of HTTP. No other questions were raised. This video should help most Web/mobile developers better understand the improvements made by HTTP2 to the transport of Web data over the Internet. The target audience for this Mashable Ask A Dev video is potential Android Developers who are most likely already Apple IOS developers. The Authors informs viewers how to decide between using objective C or Swift when developing Android Applications. Author using how will you learn and what do you want to learn as criteria for making your decision. One question raised in the video is what is Swift? Turns out it is an Apple developed mobile language that supports IOS and OS X. The big question is how objective is this author when you consider he himself is a Apple developer. This video would be most helpful to Apple developers looking to extend their reach into the much bigger Android market. The target audience for this Mashable Ask A Dev video is Android developers who want to code for Android wearables. The author informs his audience of which APIs and APKs are needed to code for the Android watch. The question raised in this videos is how different is coding for Android wearables as opposed to Android phones and tablets. Beginning Android developers might also question how they would get access to the APIs and APKs mentioned in the video. This video will be most helpful to experienced Android developers who already have some experience coding for Android wearables. The new style icon located at the top of the apply styles window.